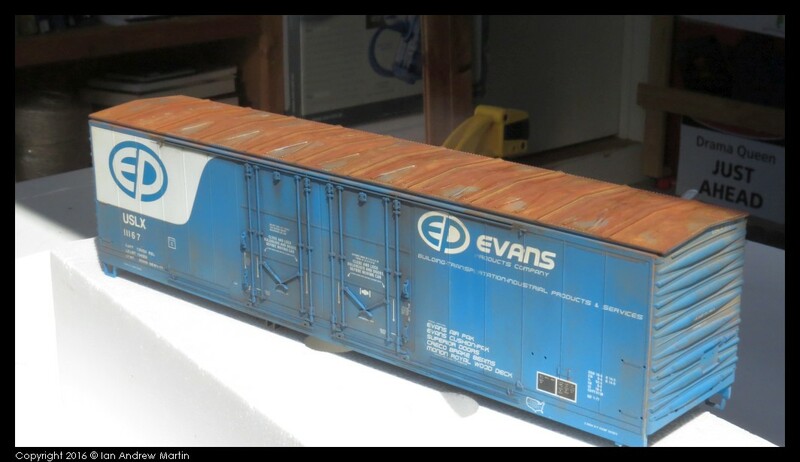 This is part five of multi-media weathering and covers what I consider to be the most important part of a freight car, no matter what type it is, because it is often what we see most – the roof. It is worth focusing a lot of your effort on car roofs. Their condition has a direct effect on the rest of the car. 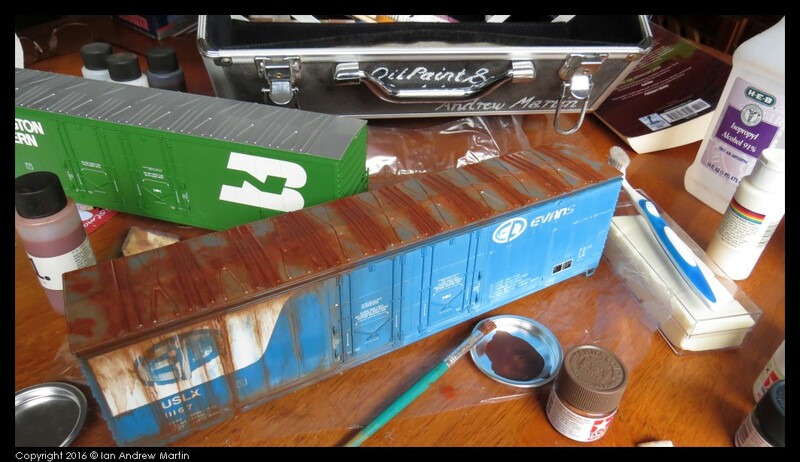 Modelling rust on a car is not rocket-science; it is a process though. 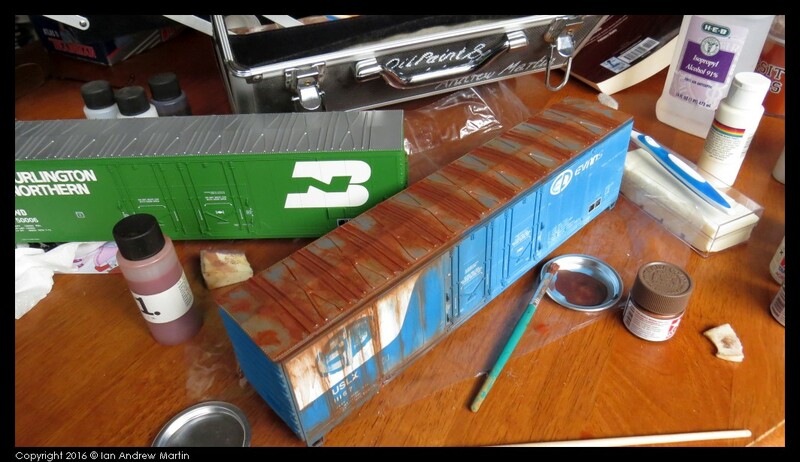 Let me take you through the stages of how I did the roof weathering on this Atlas O scale 53′ plug door boxcar. Our aim is to get some dark colour down to outline the area of maximum rust. Additionally we want to get some basic roughness down on the roof to help later in the process. Image 2 shows the initial stipple of paint only on the areas around the roof panel joints as this is where the rusting begins. 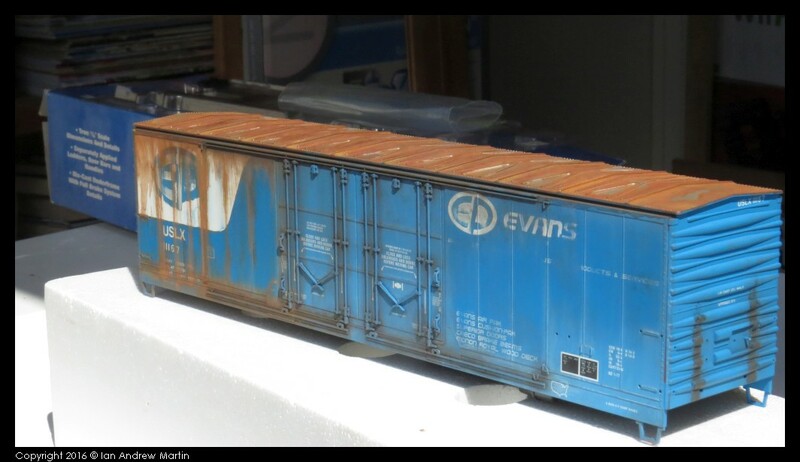 Since I model cars in the mid 1970s through the mid 1980s I apply weathering that is appropriate for the era. Not too much and not too little. Image 3 shows me stippling the paint on using a stiff (and cheap) paint brush. It needs to be very stiff to ensure that you can use it end on. You are not painting here, but wet stippling on the roof of the car. Image 4 shows me using the makeup sponge to remove the stippled paint. The aim is to make the dark base rust look more random along the roof panel join lines. 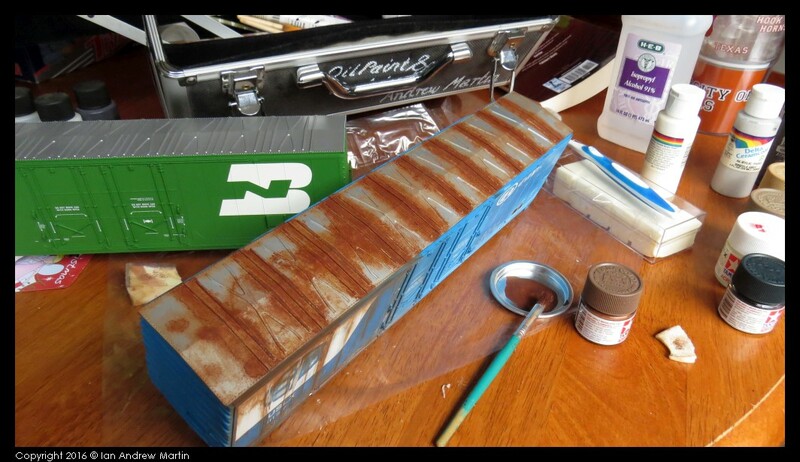 In Image 5 I’m using the excess paint in the sponge to place light rusting on the roof between the roof panel joins. This provides tooth and a base from which to work from for the second round of rust. The second round of dark rust aims to provide additional focus on the rust applied and randomised in step one. I’ll be adding rust to current patches, adding single spots of additional rust and randomising areas already painted to provide a better base to continue working from. In image 6 I’m adding random rust spots outside of the panel joins where I’ve already applied rust. These are given a moment or two to dry off and then they are dabbed over with a makeup sponge. This provides a hard outline around the rust spot and spreads the paint out and around the local area. Image 7 shows the work in progress – adding paint with the stippling brush and removing paint using the makeup sponge to increase the depth of the rust. Do this as often as you feel you need to until you get the result that you want. 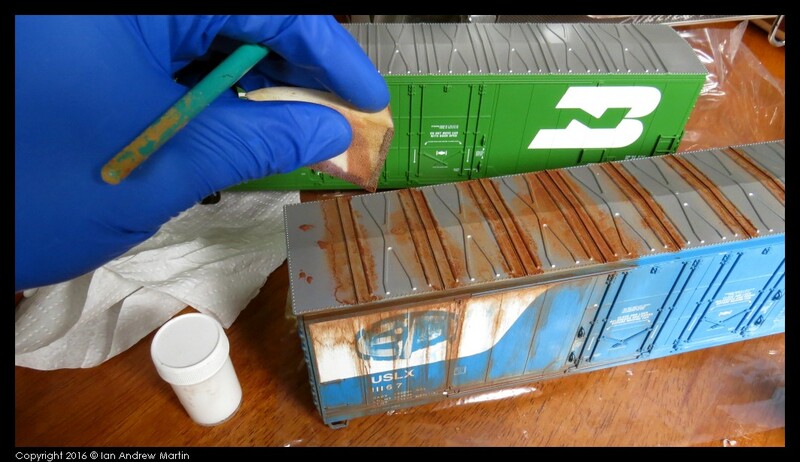 For light weathering use less of this process, for heavier weathering use more. Focusing only on the areas that you want the rust to be on. 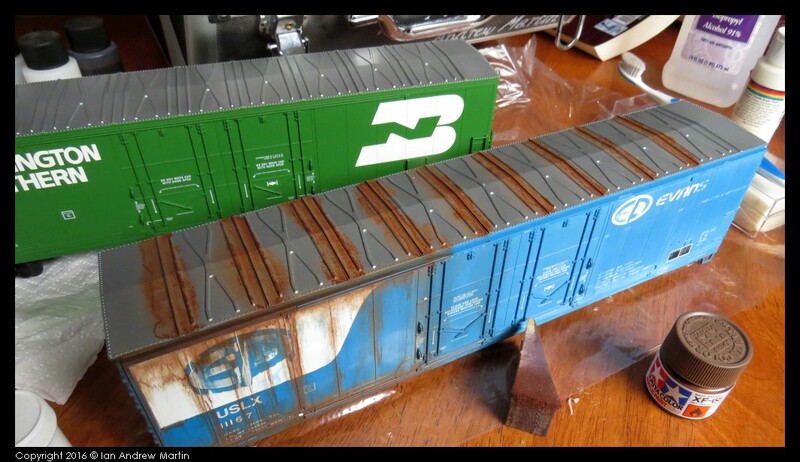 A lot of people I know don’t use RustAll for weathering. I still like using it. It suits the way I weather and I find that it gives me good overall results when used as a part of a larger system. I only use parts 1 and 2 of the four-part system. 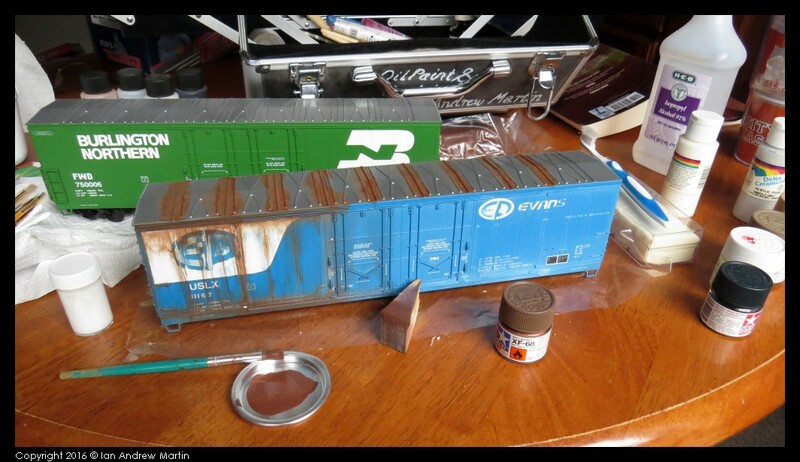 I find that these work well with AIM’s weathering powders. You can find out more about the RustAll system here. In image 8 the first coat of RustAll #1 has gone down. Notice that these are covering over the paint we used in the previous step. The RustAll looks very red and contrasts well with the Tamiya NATO Brown to begin to model more active rust on the model. Active or new rust is a lighter colour than older rust. The rust shades from browns to reds and oranges and with brand new rust you are looking at a very yellow-orange colour. 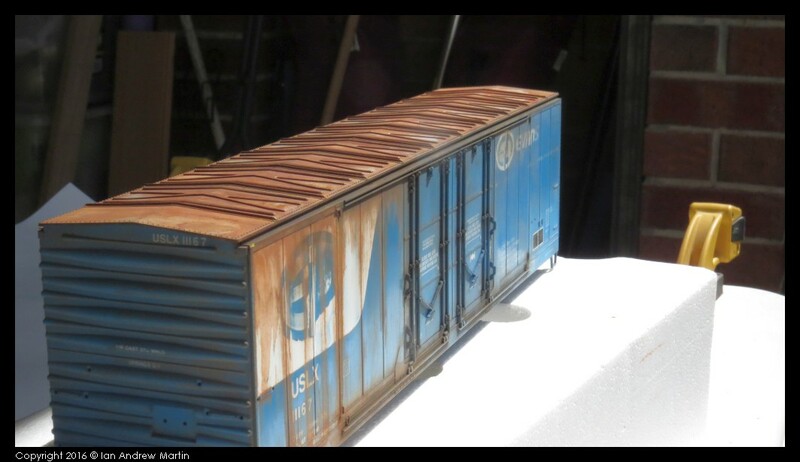 This is how you can show the different types of rust on a model. Image 9 shows the second round of RustAll being applied. Notice that now you have multiple colours of rust appearing on the model. 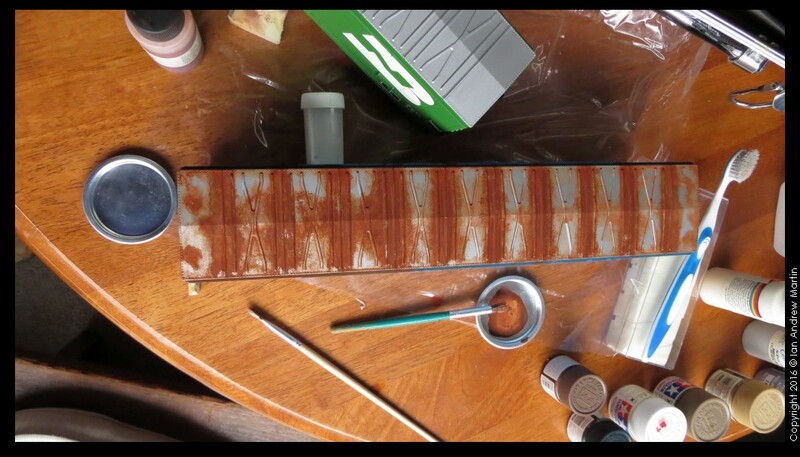 The lighter (redder) rust colours of the RustAll, the darker older surface rust of the Tamiya NATO Brown in between lightly speckled between the rest. Image 10 shows the completed RustAll weathering. Contrast that to image 11 below which is a similar look down view showing the completed acrylic weathering. 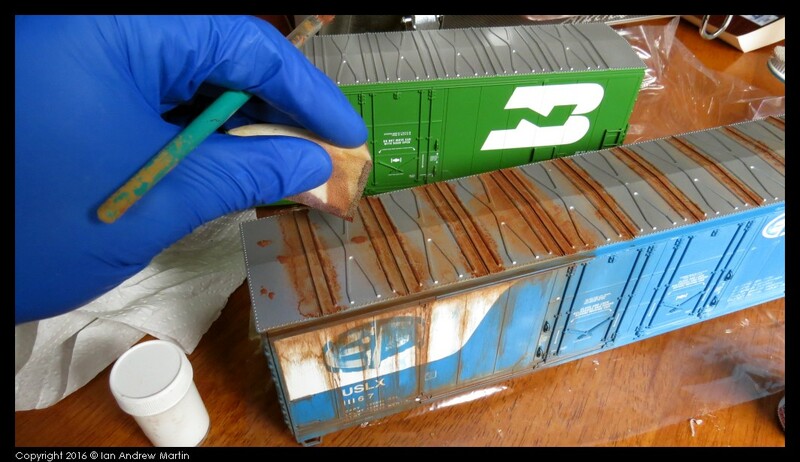 I use AIM weathering powders for all my weathering. I’m looking into Pan Pastels as used by Mike Confalone for his weathering; for now though I’m enjoying the visual quality I get from the AIM products. What I like most about the AIM products is their ability to be mixed for an almost limitless colour range. You can find out more about the AIM Weathering Powders here (now owned by Monroe Models). In Australia (and thankfully very local) I get my re-supplies from Brunel Hobbies – Cheltenham Victoria, AU. The AIM kit I bought in 2005 before we left the USA has lasted me a long time. I don’t have a video of this process at the moment but will be creating one soon from the next car in the queue and I’ll put that up on YouTube – so look out for that soon – likely early 2017. 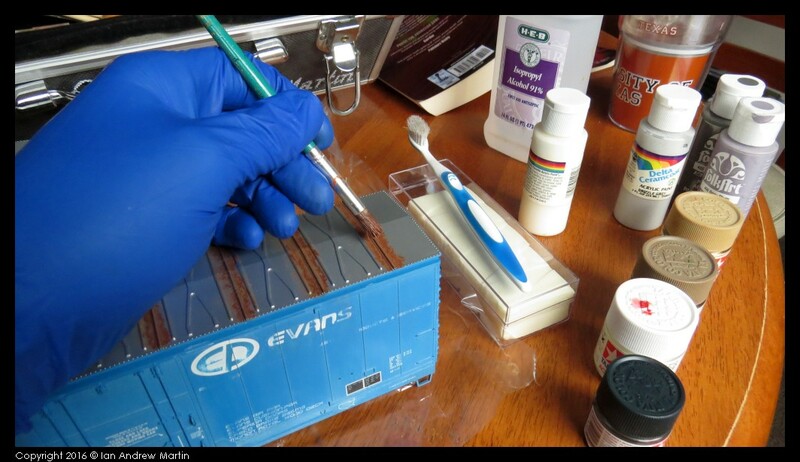 Use a small harder bristle brush to apply the weathering powders. The AIM products are colour and a binder all in one so the use of the small hard bristle helps activate the binder to ensure that the colour sticks to the model. 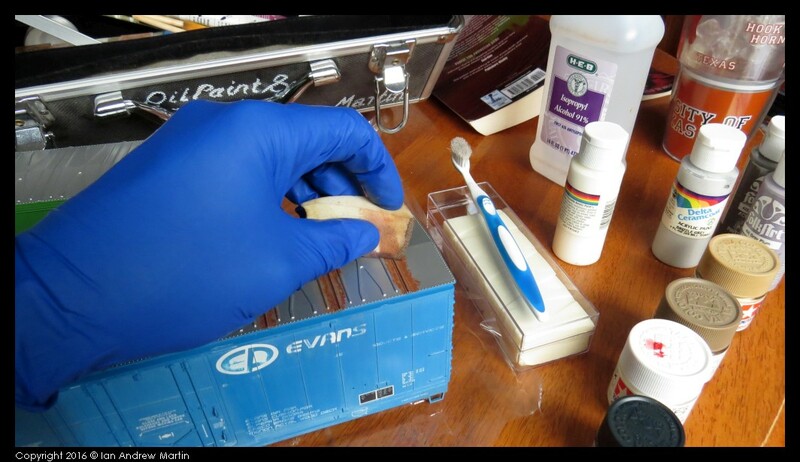 In image 13 you can see how the layers of powders, RustAll and acrylic paint work together. The powder is opaque, but when applied thinly (which I’ll get to in a second) it provides depth and contrast to the painted surfaces below it. It works for me in any case. 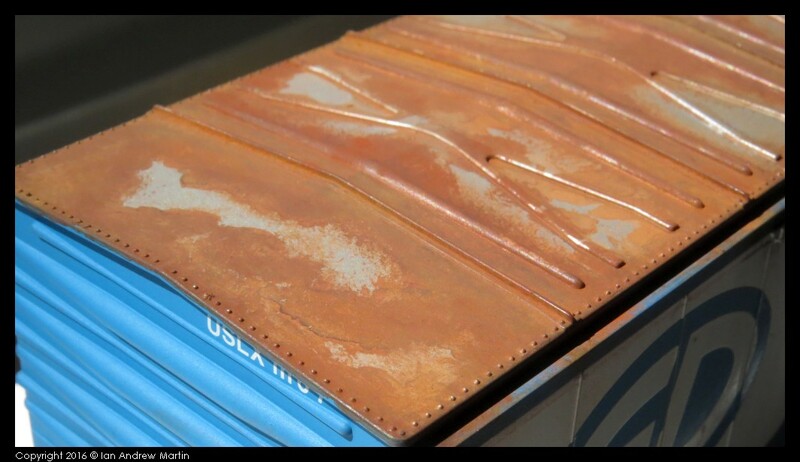 Notice also that there is infinite variation of the rust colours around the edge and interior of each panel and features within each panel. Finally using a large soft bristled brush (a lady’s makeup blusher is ideal) begin gently stroking with surface to blend the colours together and remove any remaining loose powder. Image 14 shows how the roof looks in good old sunlight. This is side one of the car. I do not use any hairspray, Dull Coat or other sealer. I’ve not found one yet that does not ruin the look of the car. Just leave it as it is and if you need to, touch it up occasionally. In the real world nothing stays the same for any length of time. 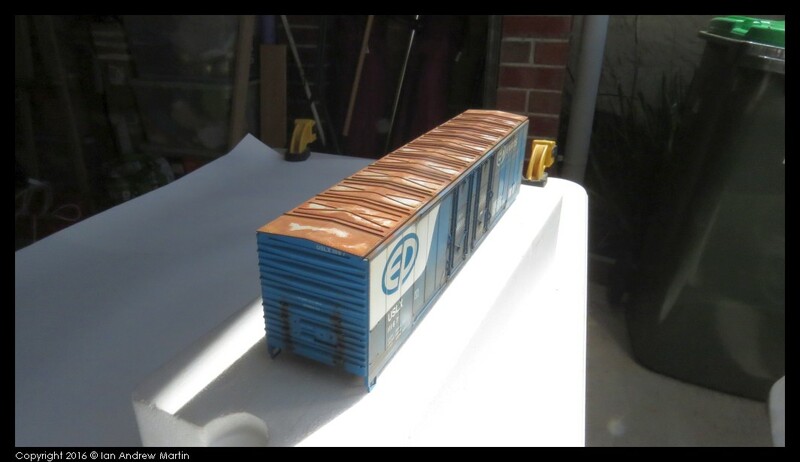 Image 15 shows the car again in sunlight and you can see the natural look of the roof weathering. I always weather each side of the car differently. One lighter and the other one much more heavily weathered. This allows me to run different eras on the same car by turning from one side to another. 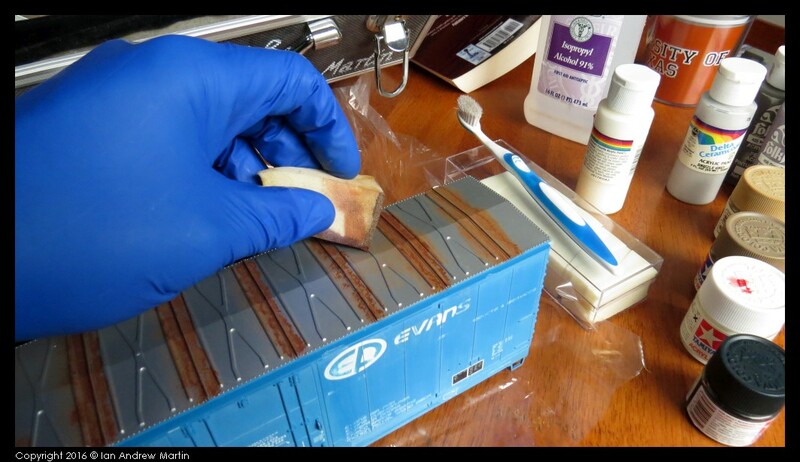 This is a simple, repeatable and good-looking weathering system using the simplest of tools materials and methods. It gives consistently good results and I believe they mirror exactly what you’d expect to see in a drier area where my cars are in use.